We added glass doors, illuminated with LED light. Quartz counter-tops, farmhouse sink, stainless steel appliances were all installed. A radius bar-top was added to separate the rooms and give a place for 30" bar-stools. Custom hand-made tiles were installed to add a great detailed color to the back-splash. A custom hood with exhaust vent insert was built and installed, and still allowed for the upper cabinet to still be used for storage. Alder cabinets, granite countertops, glass backsplash with ceramic tile ribbon. Custom glass liquor cabinet with lattice line storage below, spice rack pullouts, and plenty of additional storage for a small area. This is the 2nd project with our customer. This time we were able to remodel this craftsman style home in Dana Point he had upgraded to. This home had so much character. The framing was true 2x6 rough sawn lumber. framed true and plumb. Hard to find these days. We removed a couple non structure walls to really open up the space in the kitchen and, now, dining room. The custom glaze colored cabinets, dark charcoal island, and the marble counter-tops, by far are amazing. White subway tile, wood look tile flooring throughout, and some custom LED lighting features finished it off. A spectacular kitchen remodel. Espresso custom cabinets, Carrera style quartz countertops, and a Carrera Marble and Glass tile backsplash. Specialty pendant light fixtures and LED under cabinet lights really set it all off. We removed the old oak kitchen, fit the same floor plan with some fun improvements and storage options, New Venetian Gold Granite, Tumbled Travertine Tile back-splash with under cabinet lighting. We even kept the original flooring in place. The plan called for removing the partition wall that separated the living areas, and opening the floor plan. We installed a moment frame beam to support the second story with only a single pillar in the middle of the room. A new custom kitchen with quartz countertops gave us the modern look we were going for. New framing and ledger stone finished off the fireplace, new recessed can lights throughout, and engineered hardwood floors throughout the house. Epic has completed several projects with this family and the kitchen area was all that was left. Custom Charcoal cabinets, quartz countertops, and unique white pillow top backsplash made the room expansive. We extended the original island to provide more space and work area, and the colors really brightens the room. Floorte' vinyl floors completed it by providing a floor that can hold up to almost anything. Thank you for yet another great opportunity in this home. We prepped and painted the cabinet with a Swiss Coffee paint. We removed the granite and replaced it with a new off white Quartz with a square edge detail. The back splash is a 3x6 ceramic dove grey tile. We updated the island by adding matching cabinet panels and a small bar overhang for a couple bar stools. The new colors really brightened the room considerably. A new stainless steel sink and fixtures finished it off. This one was fun. Epic removed the small and odd island, created a new layout with a peninsula, custom cabinets, granite tops, & travertine backsplash. The classic white did not stop at the kitchen. Black and white tile floor and accent in shower walls. White subway walls and beadboard cabinet with black granite top. The classic country continues in the hall bath. Frameless glass shower doors allowed it all to stand out, and the polished chrome fixtures brightened it up. We replaced the window, custom cabinets to create more storage, quartz counter-tops with square edge detail, a farmhouse sink, and a white tile back-splash with colored glass liner. The grey 12x24 tile floor also helped bring it together. We raised the ceiling to 8 ft., new custom cabinets, new lighting, appliances, and quartz counter-tops. We added seating to the room with a large over hang on the island, and ran power to the island to replicate the microwave. We removed an unused walk through door to the other room and change the layout a bit to allow for a nice window pass through to the formal dining room. Updating a small space to make it appear larger is always a challenge. This customer had started some work in other areas of the home and wanted the same feel and color palette to move into the kitchen. Epic removed the pocket door into the kitchen and re-framed the wall to create a open pass through. This created a new line of sight and allowed the rooms to come together. Now you are a part of the conversation no matter where you are. Rustic knotty Alder Kitchen cabinets, wood look tile flooring, quartz countertops, and the beautiful white chevron tile backsplash made the room come together. The grey grout in the backsplash really makes it stand out. Our crew did it again and completed this project in less than 3 weeks, start to finish. Epic had the opportunity to work with a great customer again. With this, we remodel the kitchen with new custom cabinets, quartz countertops and set it off with a subway white tile backsplash, New laminate flooring, new interior doors and casing, baseboards were also installed. Then new tongue and groove ceiling, can lights and trim. New windows, and the best part was the addition of the stained Knotty Alder barn door became the focal point of the living room. All done and it turned out amazing. Epic also updated the small laundry closet with new cabinets, a shelf for storage, and new bi-fold doors. A Full Remodel in Irvine, CA. We had the opportunity to design and install a new kitchen. The new colors really warmed up this living area! Check out the rest of the remodel in the additions gallery. 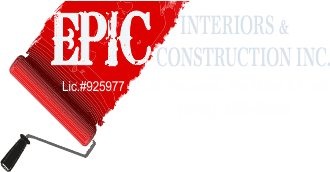 Epic was given the chance to provide an estimate for the repairs from a water leak. Custom cabinets were built and installed, granite countertops, and the customer selected a nice glass backsplash. Durango creme versi tile was installed throughout the first floor to replace the old laminate wood floors. A new vinyl window was installed to brighten the kitchen area. Then new appliances and a little paint finished it off!